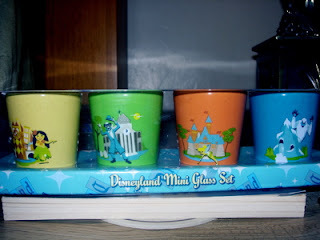 This is a Disneyland Mini Glass Set of 4 colored glasses with retro designs by artist Shag. 1 glass of each color: Blue, Orange, Green and Yellow. Each glass depicts a Disneyland icon: " The Matterhorn", "Sleeping Beauty's Castle" (with Tinkerbell), "The Haunted Mansion" and "It's A Small World". This set is unopened, brand-new and is displayed in a beautiful retro-style box. This was a Disneyland Park exclusive. 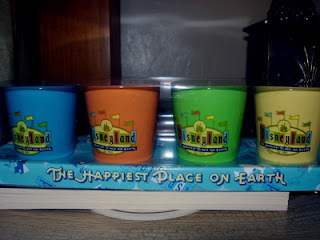 A great gift for someone who loves Disneyland or collects Disneyland memorabilia, or who just wants something cool and colorful.